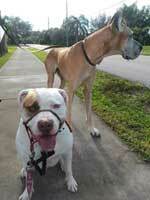 In this class we will show you how to change your dog’s on-leash reactive behavior. You will learn to lower stress (in both you and your dog), build calmness and attention, train alternate behaviors to reactivity and/or over arousal, reinforce the absence of reactivity, and most importantly build your dog’s confidence and trust in you to support a safe emotional state which will facilitate behavior change. We understand that there are many details you need to know in order to make an informed decision about registering for the Reactive Dog class. Please look over this page or contact us for more information. FEE: $349.00 per dog for 6-week course (both spouses may attend). CLICK HERE to fill it out online. After you register for a working spot you will need to return this to us as soon as possible. You may have worked with us before and submitted behavior information in the past. Please fill out this short form anyway. CLICK HERE for instructions on how to submit your video. Please do this as soon as you’re registered. The sooner we receive it the better. To tell if your dog needs to come for a gear check on Day Two, you will be asked to submit a short video of you walking your dog in a safe area on his or her regular equipment so that we can evaluate your dog’s equipment needs. We need this video as soon as you register for class so please work on that and get it to us asap. If no equipment change is needed, no appointment is necessary and you can use this time to work at home on the homework lessons we will provide to you. You are also welcome to request a class two appointment to discuss any homework questions you may have after viewing the homework video. Please submit your video(s) to both Dr. Radosta (info@flvetbehavior.com) and myself (woof@luckydogsportsclub.com). Class Size: Working spots are limited to 6 dogs per class so don’t wait to register. Unlimited auditing spots (observe without your dog; see details below). By watching the online seminar and homework videos you will learn about reasons for reactivity, gain a better understanding of your dog’s body language so you will have critical information about his emotional state of mind, and be introduced to some of the tools and techniques we will use to manage your dog’s reactivity. The link to view the videos online will be emailed to you. You may also choose to watch just the online seminar, or audit the class without your dog (see details below.) If all the working spots are full, this is also the best way to potentially get a spot should someone have to drop out at the last minute. It is critical before your bring your dog to class that you spend some time every day at home working on the first set of tools outlined in the videos. There are a total of 5 classes with your dog. Some will be inside at Lucky Dog and two may be off-site (including the last class which will be in Abacoa in Jupiter). Suitable equipment may include a martingale (limited slip) or regular collar; a harness (regular or the more typically recommended control harness (such as the Easy Walk, Freedom, or Sensible); a head collar (such as a Gentle Leader or Halti). Your dog will not be permitted to wear either a pinch or choke collar in class. Bring what you have so that we can check the fit; or purchase the recommended equipment when you arrive. A regular leash is also required; no retractable leashes are permitted. We will schedule an appointment with you to accomplish this. You will be required to bring (or rent) a crate for classes 2 and 3. A crate is an important place to keep your pet secure when he or she is not working, as well as a place for your dog to rest and process information. Ask us for our crate training handout if your dog is not familiar with being crated. (Feeling comfortable in a crate is a gift you teach your dog to prepare for travel or boarding, visits to the groomer or unexpected stays at your veterinarian.) Feel free to contact us with questions. See below about the option to rent a crate for the two days it’s needed. You may register to attend the 5 sessions without your dog and observe the class. This also includes the online seminar and all of the class handouts and videos. You may want to register to audit if you want to be first on the waiting list for a working spot. Occasionally, there are withdrawals due to unforeseen cirmcumstances after the first or second class. ITEMS FOR CLASS: You will need to bring these starting from the day when you attend with your dog. Collapsible Crate – either soft or wire. You should be able to fold it up and carry it easily and your dog should fit comfortably in it. This is an important step; please start crate training early if your dog is not familiar with the crate. If your dog cannot be crated, please email Dr. Radosta at info@flvetbehavior.com. If you want to teach your dog how to crate happily, please ask for our handout. (Note: We regret that we do not have the space to store your crate for class but if you prefer not to lug your crate to the 2 classes in which it will be needed, ask us about crate rentals.) Crate cover- any cover will do including a sheet or a large towel. Collar – There will be no pinch collars, shock collars or choke collars allowed in class. Dr. Radosta may recommend a head collar (such as the Gentle Leader or Halti) or a front-clip control harness based on the video you provide to us. If it is decided that your dog needs more appropriate equipment you will be given an appointment for a fitting. Mat– easy to carry and something that your dog will fit comfortably and completely on. A bath or yoga mat work fine. Treat bag. Hinged or magnetic opening, as opposed to draw string, is recommended. You can purchase one at Lucky Dog. Treats– Lots of really tasty treats cut into very small pieces (about pea size). Please bring treats that your dog will love even when he or she is stressed or nervous. This includes chicken, hot dogs, liverwurst, cheese, etc. Manufactured treats may interest your dog at home but will probably be ignored in class! Please bring lots of treats (3 snack bags full)! RECOMMENDED RESOURCES: We strongly recommend that you order them now and get a head start on your understanding of your dog. It’s especially critical to understand your dog’s body language to be most successful in class. The first item is of the highest priority and we recommend that you watch it before class begins. Don’t Shoot the Dog, by Karen Pryor –Your dog should know how to sit and down reliably for class. We have free handouts and videos to help you train your dog. Please contact me if you would like any of these items. Please contact me if you have any questions. Dr.Radosta and I are looking forward to a great class with you! It is never too soon to begin organizing for the best class experience. Please submit a video a few weeks before class. BEHAVIOR QUESTIONNAIRE: If you have not sent in a behavior questionnaire, please do so now. Everyone needs to do this even if you have taken private lessons with either Dr. Radosta or me. THE RIGHT EQUIPMENT IS KEY One of the important aspects of changing your dog’s behavior is getting him or her under control while on walks as well as in class. The type of equipment you use with your dog while walking is critical to that control and your success. In order to determine if your dog will need to be fitted with a new head halter, harness or leash we would like for you to record a short video (30-60 seconds) of your dog walking on a leash in a quiet area. This is easily accomplished using your cell phone. Ideally, someone else should take this video. A front view and also a side view would be great to assess ease of walking and leash tension. After you record it, please share it so that we can view it and evaluate your equipment needs. Please make sure that you and your dog are both on the video as we want to see how you and your dog walk together. Please note, the purpose of your video is not to assess your dog’s reactivity on the leash. Do not deliberately cause your dog to show aggression. Ideally, we would like to have the videos back to us as soon as possible and before the first night of class. Include information about the type of equipment on your dog that is shown in the video because sometimes it’s hard to tell. HOW TO SEND YOUR VIDEO: You may not be able to email your videos because they may be too large. To avoid that, you can try to take very short snippets and attempt to send multiple videos by email. You can share your video to YouTube.com or Vimeo.com and then send the link to woof@luckydogsportsclub.com . You can opt to keep the video private so that the general public will not be able to view it. Both of those sites offer a free app that you can download onto your phone and which will then allow you to upload your video from your phone to the site. Alternatively, you can upload it to any cloud that you are using and send an invitation to both Dr. Radosta and myself to view it. Tips: Here are instructions on how to upload to YouTube: https://tinyurl.com/hcdrpts. If you don’t want it to be viewed by everyone, list it as private in the drop-down privacy setting. This will allow you to only share it with the people you choose (like us!). Are you a beginner? Check out this helpful video: https://tinyurl.com/y8klj24t. If the video is on your phone, be sure to first download the YouTube app and then it’s a cinch to click “share” on your video and upload it to YouTube. In this class we only deal with dogs that are reactive while on-leash. For other types of issues, please contact us for a private lesson. Reactive dogs are not hard to spot. While on leash your feisty fidos may lunge at people or dogs that get too close. They may also bark loudly, and/or growl and some may even try to bite anyone foolish enough to get close. The reactive dog can appear threatening to other people as he or she jumps, barks and stares. Reactive dogs tend to stress out their embarrassed owners as these owners try to keep passersby safe from their intimidating or noisy best friend. This aggression is fear based and this behavior is called reactivity. On the other end of the spectrum is the dog that’s too afraid to go anywhere and will hide, tremble, or whine. If your dog can’t calm down within a few seconds, he or she is probably a reactive dog. There is no longer a need to feel lost or confused when your dog becomes reactive. This very special class will help you change or manage your dog that overreacts in new situations or with new people or other dogs while on leash. In the Reactive Dog class and your dog will learn many things. Your feisty Fido will learn how to feel more confident and comfortable in different situations and around other dogs and will gain more trust in you. We will work to change your dog’s problem behaviors and replace them with more appropriate behaviors. You will have new skills to utilize in these once-stressful situations and you will relax as well knowing what to do and how to avoid or manage the triggers that were once unpredictable. You will learn to read your dog and communicate on a different level. You will acquire the tools you need to understand and handle your dog with confidence. Learn what your leash-reactive dog is doing, why he’s doing it, and how to change it.Teach your dog to relax and trust and overcome fear and anxiety, the root of his or her reactivity. Develop a better working relationship with your dog. Learn how to decrease the stress in your dog and teach him or her confidence and focus. With decreased stress real learning can begin. Learn calming and management techniques, coping responses, and emergency escape exercises. Work with your dog in a controlled, supportive environment with a small group of dog owners who understand your issues because they share them. Who is this class NOT appropriate for? All of the behaviors listed below are best handled in a private session; they are not addressed in this class. Please contact us if you are not sure if this is the right class for your dog’s issues. There are no refunds once the class begins. Dogs whose only issue is guarding resources such as their food dish or toys. Dogs that jump on people in a friendly manner. We can address that issue in a private lesson. That is not fear-based reactivity. 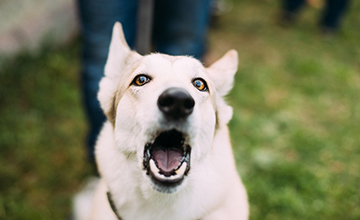 Dogs who are primarily scared of noises. Dogs who fight with the other dog(s) in their household but are fine with dogs outside the home. Dogs who have bitten a person. Dr. Radosta must do a private consultation before admitting your dog into the Reactive Dog class. Dogs who are only a problem to visitors inside the home but aren’t a problem on leash to people outside the home. Dogs whose problems are not primarily due to leash reactivity. This class is designed to modify the behavior of dogs that react while on the leash. People who are not willing to attend every class and work hard (daily practice) to effect change in their dog’s behavior. The cause and severity of each dog’s reactivity will vary, therefore each dog’s individual improvement in class will vary. Some dogs will show fast improvement, while others may take months after the conclusion of class to continue to improve. In certain cases we may also suggest private lessons to help your particular dog. While we can’t guarantee your dog’s progress, we will do everything possible to help you be as successful as possible. In class, the dogs will be separated from each other by the use of visual barriers. Slowly, as you gain skills and your dog gains confidence and starts to shed fears, the individual dogs will begin to work together from a decreasing distance. The counter-conditioning and desensitization training and handling techniques are personalized for each dog’s emotional readiness and needs. The Reactive Dog class is initially held indoors. As the dogs and owners gain skills we move to a secure, fenced area outside and finally graduate to a real-life environment.